Write Your Way Into a Happy New Year! 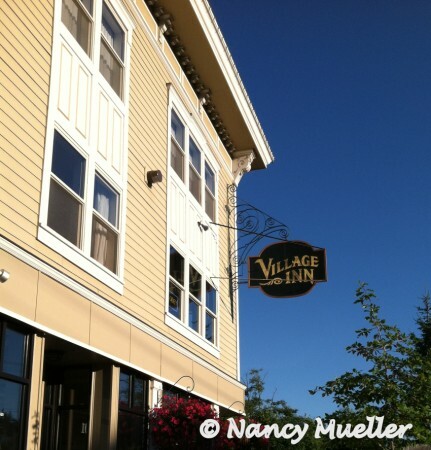 My blogging friend Tele just posted about a FREE two-day New Year “Resolutions” extravaganza that’s happening at Village Books in Bellingham, Washington on January 5th and 6th. The schedule of mini-workshops kicks off at noon on Saturday with Carolyn Koehnline’s, “Clearing Clutter for a Creative New Year” (say that three times) and concludes on Sunday with a presentation on “The Many Paths to Publishing: Self, Small, Traditional” with Paul Hanson, Sarah Martinez and Janet Oakley. While Saturday’s presentations focus on general “Resolutions” topics, like creating a personal vision and setting intentions for the year ahead, Sunday is devoted to aspiring and seasoned writers, covering such topics as journaling, blogging, writing groups, novel writing and publication possibilities. Village Books is one of my favorite community-based, independent bookstores anywhere! Staffed by helpful, knowledgeable locals who love books, the bookstore is located in Bellingham’s historic Fairhaven district. Owners Chuck and Dee Robinson have created a cozy, inviting atmosphere for bibliophiles of all ages. You’ll want to wander through the store on all three levels, browsing the collections ranging from Book Club picks to bestsellers and everything in between. 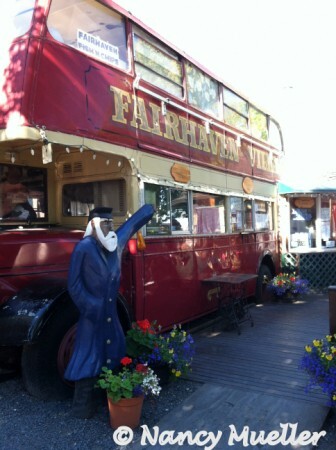 After enjoying the presentations at Village Books, just walk one block west for a stay at Fairhaven Village Inn. With scenic views of the small working harbor close by, the historic 22-room hotel evokes an elegant, bygone era, though built in 1998. You won’t find a more convenient launching pad to the many nearby restaurants, shops and town activities in the Fairhaven district, including the farmer’s market, outdoor movies or even marathons that start and end at The Village Green town square across the street. Settle in the cozy library off the lobby to read the treasures you no doubt purchased at Village Books, or peruse the many volumes lining the bookshelves at the Inn. Escape to the privacy of your spacious room to relax in a comfortable robe before sinking into luxurious bedding and down comforters for the night. Enjoy your breakfast or a glass of wine in the evening on the flower-filled terrace outdoors. 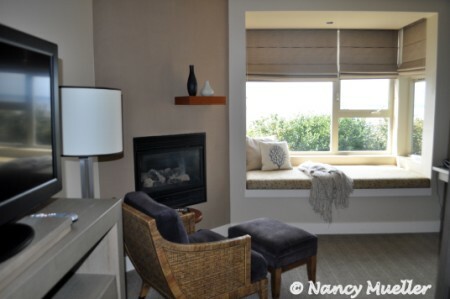 on the sumptuous bay window seat that overlooks Bellingham Bay and the San Juan Islands. Open the shoji screens to take in the spellbinding Northwest seascape from the comfort of your luxurious two-person jetted soaking tub. Or watch Leonard Cohen’s “Live in London” show on PBS, still from the convenience of your soaking tub, as I was fortunate to do during my stay. Still not enough pampering for you? Then head to the full-service on-site spa for the ultimate relaxation package. When you’re ready to get a little fresh air and exercise, take a leisurely walk along the waterfront on South Bay Trail that extends from The Fairhaven Village Inn to Boulevard Park. And be sure to stop for a latte at The Woods Coffee to complete your outing. 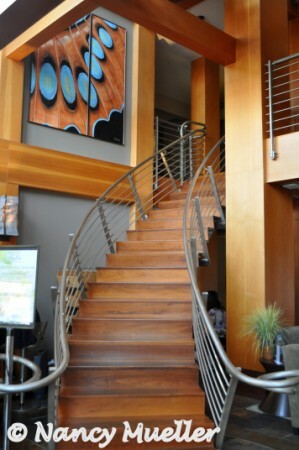 For a unique destination hotel, reserve a room at Hotel Bellwether, a luxurious boutique lodging in the cove of Bellingham Bay overlooking Squalicum Harbor. Book early for the chance to stay in the three-story, 900-square-foot Lighthouse Suite, featuring a private 360-degree observation deck with views of Mount Baker and the San Juan Islands. Complete your retreat experience with a visit to the Zazen Salon Spa for a total mind, body and spirit makeover. 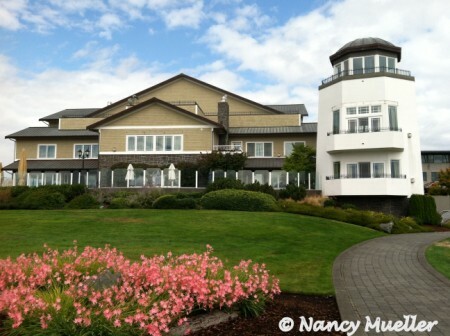 Many thanks to Bellingham Whatcom County Tourism for arranging my stays at Fairhaven Village Inn, The Chrysalis Inn & Spa and Hotel Bellwether. What weekend getaways are you planning for 2013, Wanderboomers? Please share with us here. Author. Poet. Teacher. Naturalist. Forager. Jennifer Hahn packs an impressive resume after more than 25 years as a wildlife adventurer whose travels span hiking the Pacific Crest Trail from Northern California to Canada and kayaking solo from Ketchikan, Alaska to Bellingham, Washington where she now resides. 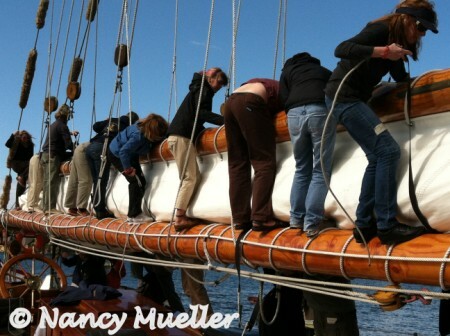 Along the way she’s also led tours throughout the Pacific Northwest, Baja, Mexico and the Galapagos Islands. In person, Jennifer is petite, vivacious and down to earth – literally. 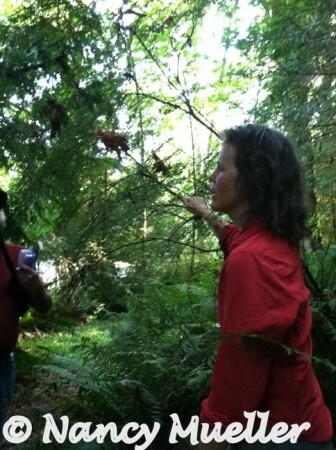 Her passion for sustainable foraging fills her conversations and writings. 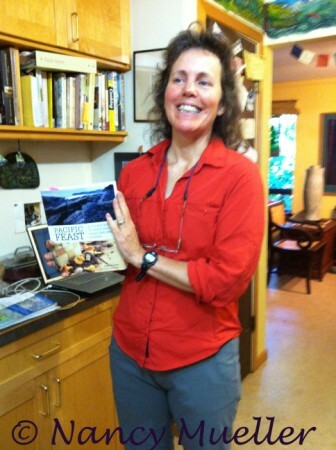 After publishing her first book, Spirited Waters: Soloing South Through the Inside Passage, Jennifer began a second book about the foods in the wild that had kept her alive on her kayaking adventure. But as a steward of the environment, she felt morally responsible to include only those foods that wouldn’t be decimated by greater consumption, resulting in her book, Pacific Feast: A Cook’s Guide to West Coast Foraging and Cuisine, and companion laminated guide, Pacific Coast Foraging Guide: 40 Wild Foods from Beach, Field and Forest. 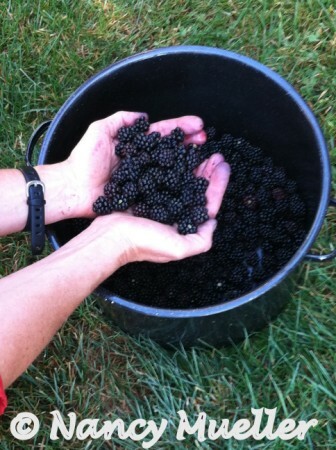 Included are her harvesting guidelines like the 1-in-20 rule when it comes to sustainable foraging. If there are more than 20 plants, you can dig one up and leave the rest for reproduction. If not, take none. With Jennifer in the lead, we’re off for a day of our own foraging adventure to discover the diversity of tasty edibles found in our own backyards. Hiking with Jennifer through the six acres surrounding the home she shares with husband, sculptor Chris Moench, is a walk on the wild side. She cautions us to watch out for stinging nettles before describing their diverse uses in cooking, fiber production and medicine. 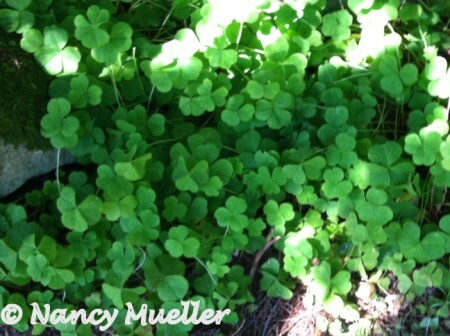 Nearby we discover wood sorrel, a shamrock-shaped plant with a lemony flavor that grows in moist, shady places. Further along Jennifer points out huckleberries, purslane, a plant high in omega 3 with a crisp, lemony bite that’s perfect in stews, and the licorice “many-footed” fern root, good for soothing sore throats. 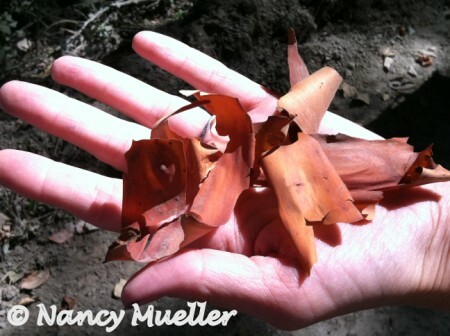 A self-described spiritual eater first, she demonstrates how to harvest mindfully and says “Thank you” to the plant for giving its life after breaking off a piece for closer inspection. Our picnic lunch at nearby Lake Padden begins with Jennifer’s recitation of Rumi’s poem that starts, “Lord, the air smells good today . . . ” Newly inspired and satiated, we continue our day of foraging fun with an afternoon hike, gathering native trailing blackberries, salal berries and strips of madrona bark we find on the ground along the way. But our day of sustainable food discoveries is not quite finished yet. Still to come is dinner at Ciao Thyme, a popular Bellingham kitchen restaurant, where restaurant owners Jessica and Mataio Gillis will show us how to create cooking magic with the fruits of our labors. I can hardly wait . . .
What about you, Wanderboomers? What’s your favorite recipe using locally sourced foraged food? What a beauty! 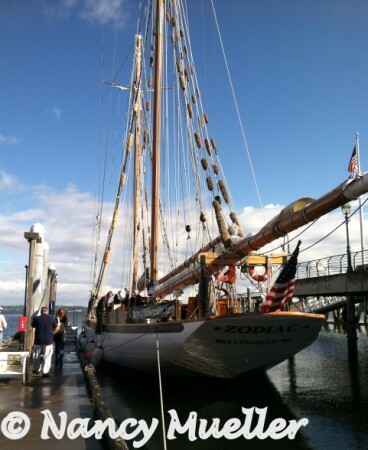 And what a fun day for those of us lucky enough to be aboard the Schooner Zodiac based in Bellingham, Washington. 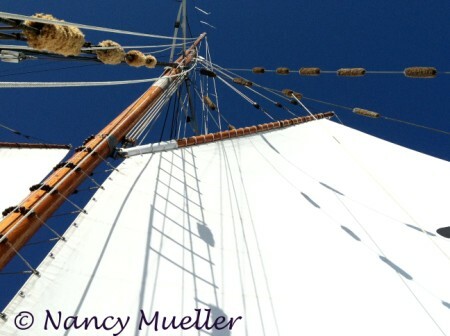 The clouds parted, the sun shone, the water sparkled, the beer and wine flowed – not too much, mind you, just enough to cap off a lovely outing on this classic wooden yacht with the largest working mainsail in North America, supported by a mast over 12 stories tall. 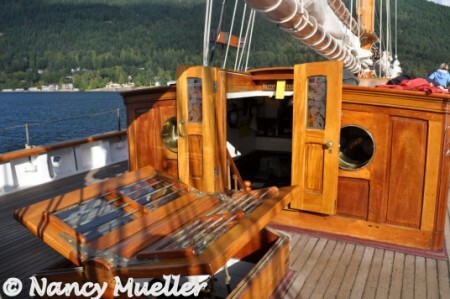 Originally built for the Johnson & Johnson family in 1924, the Schooner Zodiac retired from a 40-year tour of duty in the waters outside the Golden Gate in 1972, then headed to the Pacific Northwest. After her retirement, it took a small village of sailors and shipwrights under the umbrella of the Vessel Zodiac Corporation to restore her former elegance. We should all retire so well. 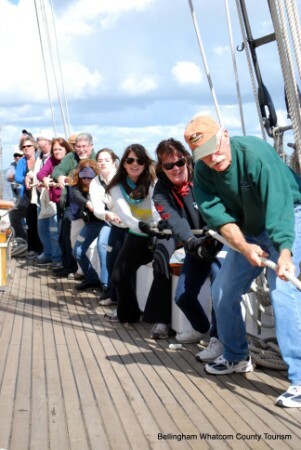 But all was not play on board the Schooner Zodiac this day. We had to sing for our lunch and dinner, masterfully prepared by cook Ian both in the galley and on deck. handle the lines and keep watch on deck. Oh, yeah, we had it rough all right. What are you doing for play today, Wanderboomers? With our geoduck and cracked crab cooking demonstrations behind us, host Jon Rowley introduces us to one more delicacy at Taylor Shellfish Farms: Mediterranean mussels. 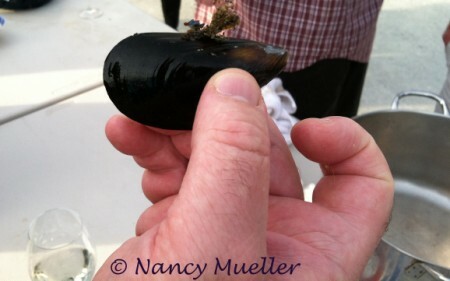 Jon explains how these glossy blue/black mollusks are cultivated on mussel rafts, from which they are lowered into the water and harvested after about a year. The mussels attach themselves to the ropes by the soft byssus threads, called the beard, at the foot of their shells. Though strong as the silk of a spider’s web, the stringy threads are easily removed just before cooking by pulling upwards along the side of the shell. But how do they taste? Time to find out! With mussels now at their peak season, when better to share Jon’s recipe for enjoying this Pacific Northwest treat than here on Wanderfood Wednesday? Debeard and rinse Mediterranean mussels. Put mussels into a hot dry skillet. The first mussel to open will drop some juice onto the bottom of the hot pan. The juice will sizzle and scorch and provide the seasoning for the finished dish. The juice from the next mussels to open go to the bottom of the pan and deglaze the bit of scorched, carmelized juice from the first mussel. Continue to cook mussels and reduce the juice until you see the mussel meats contract. Stir occasionally. 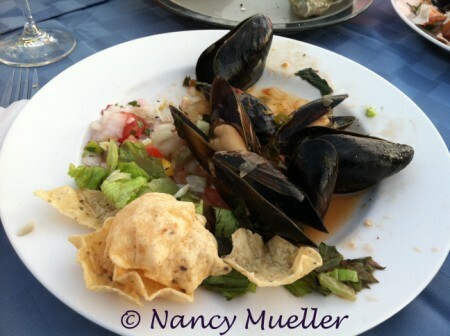 Mediterranean mussels need to cook for awhile after the shells open. The shells open before the plump meats are done. While the mussels are cooking, chop garlic (coarsely( and parsley. Use more or less than called for according to taste. When the mussel meats have contracted and are ready to serve, stir in chopped parsley and coarsely chopped garlic. The amount of juice will vary each time you make the dish. Season with black pepper. Plate when the pan emits a pleasant smoky garlic aroma. Serve over grilled Italian bread on the side. You will want to soak up the juices! How’s that for an easy, fast and delicious delight? 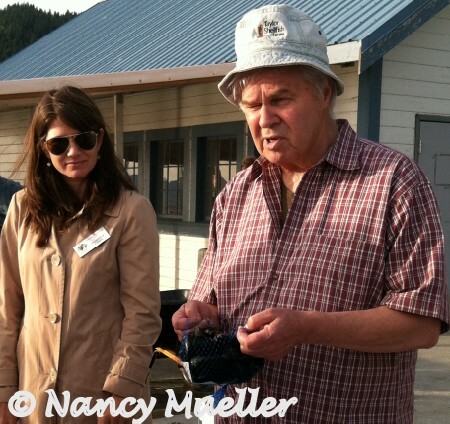 Taylor Shellfish Farms ships orders across the United States. Just click on the link to place an order. For more yummy recipes, be sure and check out Wanderfood Wednesday. 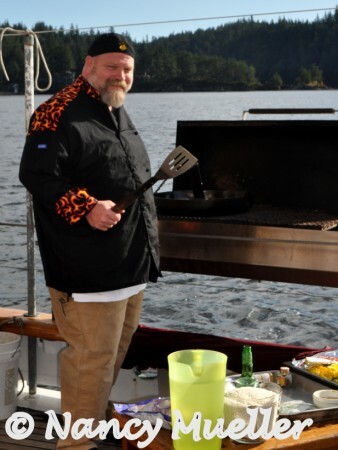 Do you have a favorite shellfish recipe to share with us here, Wanderboomers? Hello fellow wanderboomers! 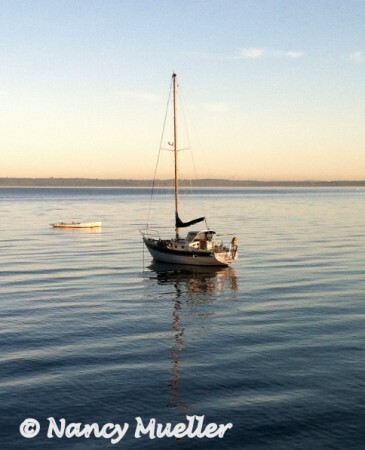 I’m a Seattle-based travel journalist, specializing in fun travel adventures for the young at heart. My articles have been featured in Hemispheres, AAA Highroads Magazine and Northwest Travel & Life Magazine where I'm a frequent contributor. When this Wanderboomer isn’t traveling, I help global executives polish their personal and professional brand for long-term results. 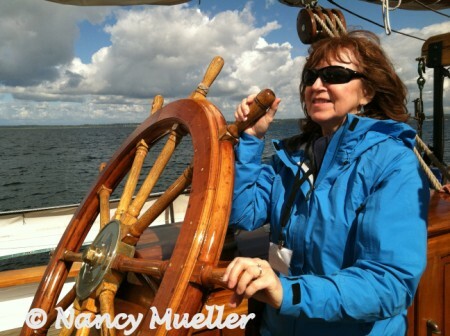 For travel tips, news & inspiration in our Wanderboomer newsletter, subscribe here.